A Japanese H-2B rocket launches the HTV-4 (Kounotori 4) robotic cargo ship toward the International Space Station on Aug. 4, 2013 Japan Standard Time (Aug. 3, 2013 EDT/GMT) from Tanegashima Space Center in southern Japan. Call it one giant leap for robot kind: A small talking robot launched into space aboard a Japanese cargo ship Saturday (Aug. 3) to keep astronauts company on the International Space Station. The Japan Aerospace Exploration Agency (JAXA) launched the humanoid Kirobo "robot astronaut" into orbit from the Tanegashima Space Center in southern Japan as part of nearly 3.5 tons of supplies and equipment to resupply the space station's six-person crew. 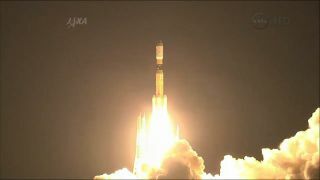 "The flight goes very smoothly," a JAXA launch controller said as the HTV-4 spacecraft entered orbit. The Kirobo space robot is a diminutive mechanical person just 13 inches (34 centimeters) tall built to converse with astronauts on long space voyages. The robot, and its ground-based counterpart Mirata, are part of the Kibo Robot Project to study human-robot interaction technology. Kirobo speaks Japanese and is expected to talk to JAXA astronaut Koichi Wakata when he arrives at the space station in November. Kibo, which means "hope" in Japanese, is the name of Japan's research laboratory module aboard the International Space Station. The name of Kirobo is a merging of Kibo and robot, project officials have said. Kirobo and Mirata were built by scientists and engineers at the by the University of Tokyo's Research Center for Advanced Science and Technology. Both robots come equipped with voice-recognition and face-recognition technology, as well as a camera, emotion recognition and natural language processing. The Toyota Motor Corp., Robo Garage and the public relations company Dentsu Inc. are partners in Kibo Robot Project. You can follow Kirobo's mission online via Twitter using the name @Kibo_robo. "Among the items within Kounotori's pressurized logistics carrier are test samples for research experiments inside the Kibo laboratory, a new freezer capable of preserving materials at temperatures below -90 F, four small CubeSat satellites to be deployed from Kibo’s airlock as well as food, water and other supplies for the station’s crew," NASA officials said in an update. "The pressurized section also is delivering new hardware for the Robotic Refueling Mission to demonstrate robotic satellite-servicing tools, technologies and techniques." The H-2 Transfer Vehicle-4 separates from the H-2B launch vehicle second stage after launching on Aug. 3, 2013 EDT. This is the fourth mission for JAXA's HTV program (the name is short for H-2 Transfer Vehicle) since 2009. The cylindrical disposable spacecraft are built to haul up to 6 tons of cargo to the International Space Station and then be discarded at the mission's end. HTV craft are called Kounotori (Japanese for "White Stork") and are about 33 feet long by 14.4 feet wide (10 by 4.4 meters). They carry supplies and equipment inside a pressurized section, which astronauts can access after the vehicle links up with the station. They also have an unpressurized section that can be accessed via the station's robotic to retrieve spare parts and other larger gear that can be stored on the orbiting lab's exterior. All JAXA HTV spacecraft are designed to be captured using by astronauts using the space station's robotic arm. After the HTV craft is grappled, it is then attached to an open berthing spot on the orbiting lab. NASA astronauts Karen Nyberg and Chris Cassidy will control the station's robotic arm in order to capture HTV-4 on Aug. 9. A Japanese H-2B rocket streaks toward orbit carrying the HTV-4 (Kounotori 4) robotic cargo ship to the International Space Station on Aug. 4, 2013 Japan Standard Time (Aug. 3, 2013 EDT/GMT) from Tanegashima Space Center in southern Japan. Japan's HTV spacecraft are just one of several robotic spacecraft that make regular shipments to the International Space Station. Russia's unmanned Progress spacecraft and the Automated Transfer Vehicles built by the European Space Agency also make periodic deliveries. Two private U.S. spaceflight companies also have billion-dollar contracts with NASA to provide robotic cargo deliver missions to the space station. The Hawthorne, Calif.-based SpaceX has already launched two of 12 planned delivery flights for NASA using its Dragon space capsules as part of a $1.6 billion deal with the U.S. space agency. Unlike all other robotic cargo ships serving the station, SpaceX's Dragon capsules can also return hardware and experiments to Earth. NASA also has a $1.9 billion deal with the Dulles, Va.-based Orbital Sciences Corp. for at least eight delivery flights using the company's new Antares rocket and Cygnus spacecraft. The Antares rocket flew its first test flight in April and is slated to launch the maiden Cygnus delivery mission to the space station in mid-September. The International Space Station is currently home to six astronauts representing three different countries and space agencies. Its Expedition 36 crew consists of three Russian cosmonauts, two American astronauts and an Italian astronaut representing the European Space Agency. NASA officials said the space station crew watched the HTV-4 launch via a live video link while soaring 260 miles (418 kilometers) over southwest Russia. The Japanese cargo ship will be captured via robotic arm on Friday, Aug. 9, at 7:29 a.m. EDT (1129 GMT) and be attached to the space station at about 9:30 a.m. EDT (1330 GMT). You can watch the Japanese cargo ship's arrival live on SPACE.com on Friday, courtesy of NASA TV.